Our school has only qualified, dedicated and experienced music teachers and musicians with a music degree. 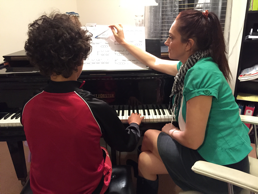 Their diverse musical backgrounds ensure that every lesson is an enriching experience. We offer lessons from a diverse range of young and passionate tertiary-qualified musicians. Our lessons are tailored to meet each student's skill level and ambitions. We offer a high quality instrumental lessons to our clients. Our school invites students to become part of a thriving musical community. We believe that there's more to a student's development than a weekly lesson. Our concerts are designed to broaden musical knowledge and allow students to meet in a relaxed setting.